I’ve posted before about this little pink page, hanging tothe right of my desk, as it has done at each desk I’ve had since I received it.But I didn’t tell its story, or ever really explain what I use it for. As Irealize that it’s been three years since it came to be, I think it’s time toreflect on it again. At the conclusion of my first semester of graduate school,our Ecology of Campus Life professor placed a series of colored sheets in theback of our classroom. Each one had the name of a classmate at the top and afun border. Our task was to go around to each one, and write something niceabout the person to whom it belonged. A memory of something they said or did,or something that they brought to the class environment, or even somethingsilly (as our cohort was prone to do) was perfectly acceptable. Despite theimpending stress of final papers and exams paired with hectic semester wrap-upin our respective offices, something interesting happened: people startedlaughing. People started smiling. And the corners of the collective mouth ofthe room turned upward. So I challenge you: how are you using words to uplift duringthis crazy end of the semester? For my part, I made sure to take time thismorning to thank our staff via email for their help in a massive campuswideholiday celebration. It’s no raise, or gift card, or even a handwritten card.But if I can make even one person smile with a few kind words, then I have donesomething great. 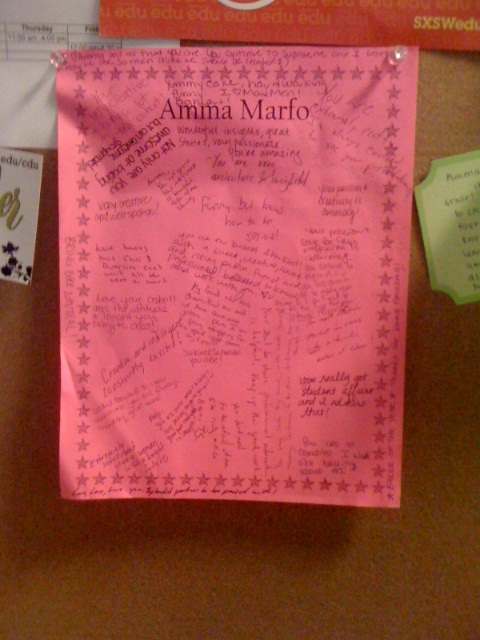 And to the CSA class of 2013, know that the greatness youshowed on my pink page is something I still truly appreciate. People can sometimes treat words carelessly, without regardfor the effects that words can have on the heart and the mind. Word choice,tone, setting- they all make a difference. But these words that I’m looking atnow to get myself through the frenzied end of fall- these words are still kind,thoughtful and uplifting three years after they were first written.